You had your own private Room and a fridge which was handy. They also provided towels. The bathroom was shared and okay. Really responsive hosts. Our flight was delayed and we arrived after midnight - everything was ok, they met us and answered all our questions. Poco que añadir a qué me gustó más. Prácticamente nada que resaltar. Die telefonische Abstimmung zur Ankunftszeit und die Schlüsselübergabe waren problemlos, obwohl sich meine Ankunftszeit etwas verzögert hatte. Internet war kostenlos und gut. The apartment was very cheap. It was super clean and grocery stores and restaurants were nearby. El apartamento estaba muy barato y limpio. Supermercado y restaurantes estaban cerca del apartamento. Das Apartment war sehr günstig und sehr sauber. Lebensmittelgeschäfte und Restaurants waren ganz in der Nähe. Wszystko zgodne z opisem, mały pokój, tarasik z widokiem na niebo /bo zabudowany dookoła ściankami/, wyposażony w stolik i krzesełka. Łazienka wspólna tuż przy pokoju, nie tworzyły się do niej kolejki /tylko 3 pokoje na piętrze/. Lokal starszego typu, ale odmalowany i czysty. Dobry na krótki pobyt lub jako baza noclegowa do zwiedzania wyspy. Blisko do przystanku autobusowego do Las Palmas, Maspalomas lub dalej na zachód np.do Puerto de Mogan / ok 250 m/. Rent o fräsht, badrum m tvål och solkräm. Och en egen terrass! Lugn gata utan störande trafik, helt tyst utanför. Hyvä sijainti pienellä rauhallisella sivukadulla ja sopivan pieni yhdelle hengelle. Garnichts. Kein Kaffee, Frühstück. Kein Nachtlicht am Bett. 1 Toilette und kleine Dusche für 3 Zimmer. Providing free WiFi, Satiago·s Private Rooms offers rooms in Playa del Ingles, an 18-minute walk from Yumbo Centrum. 1.3 miles from Cita Centre, the property is also 1.6 miles away from Playas Del Veril. The property is 1.7 miles from Playa De Cochino. Guest rooms in the guesthouse are equipped with a flat-screen TV. 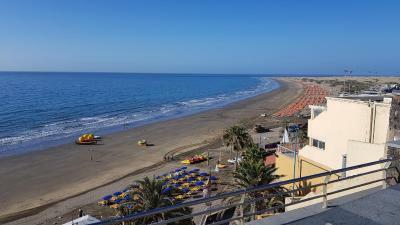 Playa Del Ingles is 1.7 miles from Satiago·s Private Rooms, while Playa De Las Burras is 2.7 miles from the property. The nearest airport is Gran Canaria Airport, 19 miles from the accommodation. When would you like to stay at Satiago·s Private Rooms? House Rules Satiago·s Private Rooms takes special requests – add in the next step! The smell in the room was rather unpleasant. Instead of some artificial smell bomb they should let some fresh air in and wash the sheets really well then the room will smell good all on its own.